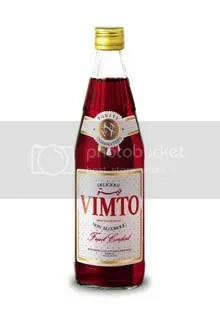 Look at this….a lovely bottle of Vimto, a cordial made from a secret blend of blackberries, grapes and raspberries and some special herbs and brewed oop north for t’last 100 years and more. It’s like the northern equivalent of Coca Cola and, yes, there is a carbonated version now and a shiny new logo style too (which I don’t really like if truth be told). It’s what we grew up drinking as kids and just recently we’ve introduced it to our two grandsons. A bit of Lancs DNA in a bottle. And they love it, naturally. They aren’t exactly talking with flat vowels just yet but it was amusing to hear our eldest grandson asking for another glass of that really tasty stuff ‘Vomit’. Ah spoken like one or two Blackpool lads I used to know. Makes you raht proud. And as Paul Daniels might have said if he’d spent less time in hospital and more time studying, ‘Now that’s Metathesis’ ……. Metathesis (English pronunciation: /məˈtæθəsɪs/; from Greek μετά-θε-σις, from μετα-τί-θη-μι “I put in a different order”: Latin trānspositiō) is the re-arranging of sounds or syllables in a word, or of words in a sentence. Most commonly it refers to the switching of two or more adjacent sounds. Ah look at these two old mates. One’s a tiny little fellah with a rather shallow personality, squeaky voice, a magic wand, and a fluffy partner who struggles to talk coherently. And the other’s Sooty. Boom boom. I think I told you earlier that I’m helping out at my super son-in-law’s super film company a couple of days a week. One of the nice things about the assignment is that our offices are superbly located virtually overlooking Buckingham Palace, home of course to Phil and Lizzie Windsor and their dysfunctional brood of liggers. You musn’t let my affection for our wonderful Royal family get in the way of a good view. You see whilst I am responsible for dragging the average age in the office up from a youthful 23 to something closer to 50, I was very lucky to have been assigned a desk by the window. Old man’s privilege. And over the last few weeks I’ve witnessed several Changes of the Guard and thousands of ordinary people dolled up in their finest togs waiting patiently in line to join Her Maj at one of her garden parties. But those queues are nothing compared to the ones which have begun this last week to go and visit ‘that dress’.